Check out our VIDEO! Hit the back arrow when you are on the first picture, it will take you to the video!! This is a one of a kind vacation property. It is interior designer owned and decorated, with ocean views and is walking distance to one of the best beaches in Southern California. It was completely renovated in the Summer of 2008 specifically with discriminating families in mind. It has a 'cottage chic' feel and is romantic yet kid friendly. Our condo is located in Dana Point, just a mile and a half from Laguna Beach. We renovated this property to a very high-standard, where literally no detail has been overlooked in making this a place where you will want to come again and again and again! The flooring is either brand new travertine tile or wood. All of the windows and doors are new. The kitchen has custom high-end cabinetry, top of the line stainless steel appliances, granite countertops, and a built-in wine rack. The kitchen also has a custom built breakfast bar that is connected with the family room so that you can still socialize while preparing dinner. In the family room you can cozy up by the fireplace which has an antique hand-hewn mantle from Virginia, or watch your favorite shows on our 42' LG HD flat screen TV. Each bedroom also has a flat screen TV. These are little 'extras' that we include in your stay with us that others often do not. There are also 3 outdoor lanais to chose from if you want to sit outside and take in the ocean breezes. The master bedroom is very romantic with its four poster bed with a sheer canopy. The bed is not just for looks sheets (600 thread count! ), mattresses, comforters, pillows are all high quality and super comfortable. In the evenings, open your windows or doors and feel the ocean breeze and let the waves lull you to sleep. Get up in the morning and enjoy the master bathroom which has double vessel onyx bowls, body jets in the shower and custom tile work throughout. The 'kids' bedroom has brand new cottage-style bunk beds with fun, bright, beachy bedding that either boys or girls will feel comfortable staying in. The lower bunk is a full sized bed and the upper is a twin; with an air mattress (which we provide), 4 people can stay in this room very comfortably. The third bedroom has a four poster queen bed that faces the ocean so you can enjoy the view from your bed! Of course, the plush, Posturepedic mattress is brand new as are the pillows, 600 thread count sheets and luxurious damask bedding. Let's not forget about the ocean view. There is a gorgeous view of the Pacific Ocean from two of the bedrooms and you can sit at the bistro table on the lanai off the master bedroom, have a glass of wine and take it all in. 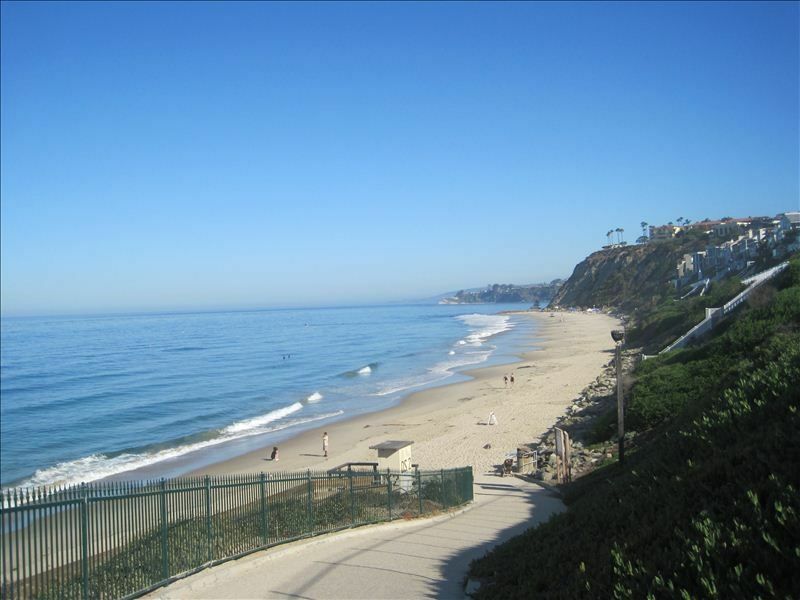 Our proximity to Salt Creek Beach is great! Take the steps down to the beach and you are there within minutes. You can also enjoy the shared pool and hot tub which is just a short walk from the condo. We would love for you to be our guests and we have done what we can to ensure an enjoyable visit! Please don't hestitate to call if there are any questions we can answer. We have 3 children and the condo is well stocked for children! We are very family oriented and love to travel. I am an interior designer by trade so we took special care to ensure that our property was not only functional, but also very beautiful. Many people criticized us in the renovation process saying that we were making it 'too nice', but we live by the belief that you should treat people the way you want to be treated. We like to sleep on high thread count sheets, so we want our guests to as well. We have children, like many of our guests, so we have made the home very family friendly while at the same time being luxurious for the parents! We absolutely love Southern California and found ourselves vacationing in the Laguna Beach and Dana Point area over and over and over. We have many friends who live in the area so we finally decided to take the plunge and buy our second home in Dana Point. We bought it sight unseen and completely gutted it to make it what it is today. We enjoy sharing our home with others and hope that many come to appreciate all the hard work and little details that separate our vacation home from the others out there! One of our favorite things to do while at our condo is watch the sunset. We will just sit on the patio or lay on the bed and as a family, watch the sun go down. We cannot seem to get enough of the Catalina sunsets! Of course, the beach is so close, that we head down to the beach with the kids and let them run around and attempt to use their 'boogie boards'. The pool was also just renovated and we enjoy lounging by the pool when the kids have had enough of the sand. The Dana Point Harbor is just a few minutes away and we frequently go on sunset sailing cruises, dolphin watching trips or trips to Catalina Island. Of course, no trip is complete without going to one of the major amusement parks like Disney, Legoland or Sea within close proximity to our condo. Lots of beach toys, boogie boards, etc. My husband and I stayed in this lovely condo to escape our Northeast Winter. We were very happy with the location as there were so many wonderful walks that we could take each morning. This condo is near wonderful restaurants. The beds were comfortable. For the most part it was the two of us but when our two grandchildren and their parents came to visit for a few days we managed well and the kids enjoyed the games and puzzles that were provided. We cooked some meals in the well equipped kitchen and ate at the dining table. Beverly and Paul were very receptive to inquiries and were very helpful. Dana Point is a wonderful town. The sunsets are amazing and you can see them from the condo. Thank you Beverly and Paul for making your home available so that we could enjoy the area. Thank you for allowing us to rent your home. Thank you for taking great care of our home. We welcome you back anytime! Thank you for allowing us to rent your home! Our family of 5 stayed at this property for a full month. The location is unbeatable, we walked to the beach, into town and to the pool. We were able to go to Disney just a half an hour away as well as Legoland, which was about 45 minutes away. We also ventured into LA and San Diego. Next time we visit we plan to stay here again! We had such a wonderful time staying at Beverly's condo, it was just perfect for our family of 5 (kids age 8, 5, and 1). The condo was just as pictured, and even better! It was clean, nicely decorated, and had all the kitchen amenities we needed to cook many meals. We loved having the gas grill available too. We spent many mornings enjoying the patio overlooking the ocean, you can't beat the view! The condo was close to so many activities including many beaches, shopping, and restaurants. We loved Strand Beach, which was just across the street, and the condo had everything we needed for the beach including chairs, towels, and beach toys. We explored Dana Point and Laguna Beach, and even took a surfing lesson in Laguna! It was so fun. Our favorite restaurants were the Harbor Grill and The Shwack Beach Grill (two opposite ends of the spectrum for price and ambiance, but both were perfect for our family!). We even took our kids to the patio restaurant 180Blu at the Ritz to enjoy the amazing sunset. We didn't stay long, just had dessert, but it was totally worth it! The staff was friendly and accommodating for our kids. We drove up to DisneyLand on two separate days, and it was easy to get there, just a 30 minutes drive. Beverly was so kind and accommodating to talk with me on the phone when our child was sick, she was so gracious! I was thankful for her help and advice as we were trying to figure out what to do and where to go if we needed doctor's attention. We loved visiting Dana Point, and staying at this condo made the whole experience just perfect. Thank you Beverly!! The owner did a great job decorating the home. The pictures truly reflect the main living areas. Only two rooms have an ocean view; the master and the second bedroom. But what an amazing view! Plus there is a patio off the master suite. I kept trying to hide from my kids on the patio because it was so amazing. The private beach directly in front of the condo was immaculate and beautiful. The condo is next to a wild life reserve so there nature trails you can take the kids. The beds were soon comfy. I could have stayed a month. The kitchen was perfect. I can't wait to go back. We have a 30 day minimum. Our property is a non-smoking, no pet/animal home. Please review the rental agreement. Exceeding the number of guests listed on your reservation could result in additional charges and/or termination of lease.